Arrow dabbles with horror when the serial killer targeting the team steps up his efforts as a couple of characters consider major life changes. One way or another family has always been at the heart of this show whether it be Oliver’s connection to his parents and Thea, his marriage to Felicity or his attempts to build a relationship with William. Not to mention the recent discovery of the sister he never knew he had. Outside of that the Diggle’s have their own family drama, Rene has his daughter and Felicity has a unique relationship with her mother so there’s a lot of family dysfunction as well as function on this show fuelling the drama on almost a weekly basis. Oliver’s role as the Green Arrow seems to be incompatible with being an effective parent to William. His life was constantly in danger even before everyone knew his secret identity and this has only intensified now that the secret’s out. There’s no denying that the constant threat of being targeted by various horrible villains is hardly the best environment for raising a son. This is clearly exemplified by Felicity’s obsession with security which is a direct result of the dangers being associated with Oliver Queen attracts. The point is that William has every right to be resentful at this point in his life. He feels like he comes second to the Green Arrow persona and it’s easy to see why when considering the choices Oliver has made. One that keeps coming up is his decision to go to prison without consulting his family. In fairness Oliver sees that as a mistake but it doesn’t appear that he has fully learned from it as he still continues to decide things for William without actually asking him what he wants. A good example of this is when he decides that Boarding School might not be the best place for him now so decides that William should come to live with Him and Felicity again. His heart is clearly in the right place but at no point does he ask William what he wants. Being expelled from Boarding School is a clear cry for attention that Oliver has largely ignored which strongly suggests that he’s incapable of being the father William needs at this point. This doesn’t make Oliver a bad person . He is clearly doing his best but has his priorities in the wrong place when it comes to parenthood. Whether he cares to admit it or not he still feels that saving the city is his primary mission which makes parenting a secondary concern. The fact that William isn’t around all of the time is proof of that as well as the fact that he’s never the focus of the plot when he is. In some ways Oliver has to prioritise his vigilante career because that’s the premise of the show. Viewers don’t tune in to see Oliver Queen raising William so the writers have to come up with ways to keep him in the background to add extra tension to his life as the Green Arrow. This does largely work even if the only way to do this is for Oliver to not be what’s best for William. Having decisions made without consulting him forces William to take his future into his own hands by calling his grandparents who put in a legal challenge to Oliver’s fitness as a parent in order to become his legal guardian. Oliver immediately goes on the defensive and refuses to give up William without realising that this is actually what he wants. 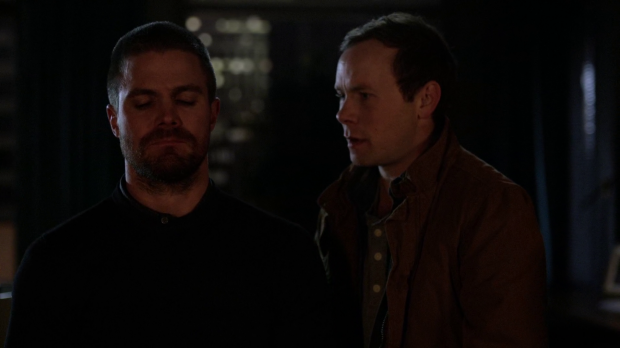 Once again Oliver’s reaction is to make it about him and makes strong declarations about winning that legal battle to keep custody of William. Once again his heart is in the right place but he entirely misses the point. Felicity is the one to move the conversation on by pointing out that they have to do what’s best for William even if it’s heartbreaking to do so. The events of this episode conclusively prove that William will be in constant danger living with Oliver and Felicity so that helps with Oliver’s decision to let him go so that he can have a happy and safe life. The final scene between then is really well played by Stephen Amell and Jack Moore who present a really emotional farewell. This answers the question around why William hasn’t seen Oliver and Felicity for years in the future timeline. On the subject of the future, this plot is currently dragging itself out just as the worst of the flashbacks did. 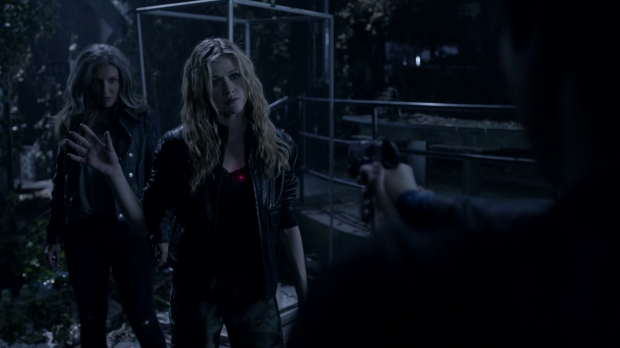 What originally started as a tense hostage situation became tedious very quickly though it is somewhat redeemed by a well executed action sequence and the reveal that Blackstar’s real name is Mia Smoak which makes her Oliver and Felicity’s daughter as well as William’s sister. This reveal is intercut with Felicity presumably learning that she’s pregnant right after coming to the joint realisation that her life with Oliver isn’t conducive to raising kids. The family drama thickens. This means that the future plot is at the point where Oliver’s son, Diggle’s son and Felicity’s daughter are in one place which makes them something of an Original Team Arrow: The Next Generation. 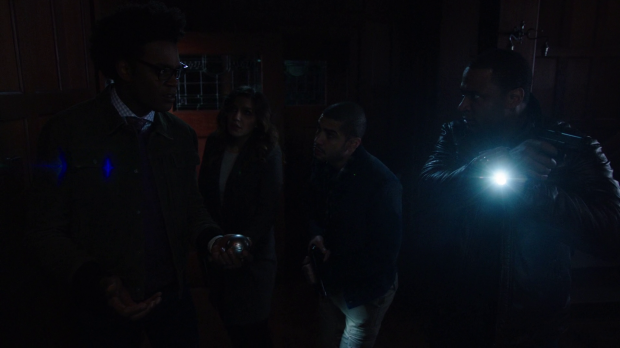 They even have the same basic roles albeit flipped around with William being more of the Felicity figure with his computer knowledge, Connor aka John Diggle Jr being the Green Arrow figure and Mia acting as the closest thing to that trio’s Diggle with her more grounded physical combat. I’m hopeful we’ll see an extended subplot involving these characters acting as something of a Team Arrow analogue as there’s a lot of potential here. As far as I can tell this timeline is around 8 years ahead of the DC’s Legends of Tomorrow season 1 episode “Star City 2046“; assuming this is the same timeline and the future depicted in that episode hasn’t been averted in some way there’s still some setup to be accomplished such as explaining how Connor finds himself working with a one armed Oliver and where the other characters end up. Based on the information available it appears that the writers are committed to this dystopian anti-vigilante vision of the future so it’ll be interesting to see the events that lead to this assuming there isn’t some sort of swerve coming that changes the timeline. I’ll admit I’m curious to see how a comic book show transitions into a bleak future where the heroes fail. Back in the present there is a serial killer on the loose as established last week. His main targets appear to be Dinah and Oliver at least for now so Team Arrow sans Oliver -who takes some time off for family drama- task themselves with hunting the killer down so that he can’t harm anyone else. The attempt to create a suspenseful situation in the dark house where lightning strikes served as mood lighting was fairly hit and miss. The thing that immediately springs to mind early on is that it felt like a Scooby Doo plot though a lot of that might be to do with the standard “split up to cover more ground” tactic met with reluctance from a reluctant Curtis who has seen horror movies even if the other characters haven’t. The “miss” part of the “hit and miss” comes from relying too heavily on shock. There are a couple of obvious misdirecting jump scares before the real threat presents itself to slit Dinah’s throat. Yes it’s a shock but the whole situation feels too manipulative and the dark lightning strike ridden location is far too stick to be taken seriously. Despite this it does appear that Dinah’s injury will have far reaching consequences most likely resulting in the loss of her Canary Cry. This feels a little too soon after being outed as the former Black Canary but it does start to answer questions posed by her appearance in the future such as where her injury came from and why she doesn’t use her powers. The questions and answers may be superficial but things are starting to come together. I would have liked to see the episode deal with the tragedy of the situation and show how Dinah initially reacts to what happened to her rather than other characters commenting on it. There will likely be a fairly long arc where Dinah struggles to accept the loss of her power if that is actually what happens. Stanley’s reappearance is really underwhelming as he feels like a far cry from the calculatingly manipulative person Oliver knew in prison. Based on his behaviour here he seems unable to fool anyone. It is possible that his prison persona was carefully constructed to get him out of there and he lost what remained of his sanity once faced with the outside world. If that’s what happened then fair enough but there was a great deal of potential for this character to present a very different problem for Oliver than he’s used to. Instead we get an insane man talking about an abusive father and insisting that Oliver is his friend before being brought down. Stanley’s tale about an abusive father and the clearly far reaching impact this has on him is meant to show Oliver an extreme example of what a child can grow into if the wrong decisions are made. Of course Oliver isn’t an abuser and is far from terrible for William but it’s an extreme example to give Oliver something of a worst case scenario. The episode was doing a lot of strong work to help Oliver decide to let William go so there was no need to sacrifice the nuance of Stanley to support this. Could this episode mean the departure of Curtis. He recently mentioned that he wasn’t comfortable with the way A.R.G.U.S. operated and only agreed to help them on his own terms. This is taken one step further when he accepts a job far away to be in charge of a department tasked with inventing things that can truly help people. Diggle sees A.R.G.U.S. as a positive force in the world and Curtis admires that Diggle truly believes that but he sees them as being really problematic even if he agrees what they’re supposed to stand for and can’t bring himself to work with them any more. Diggle offers him a position where he answers to nobody and calls his own shots but it isn’t enough for him so he removes himself from the situation onto a path where he can do more good on his own terms. It’s very morally upright and very Curtis so if this is the exit for the character then it could have been a lot worse. 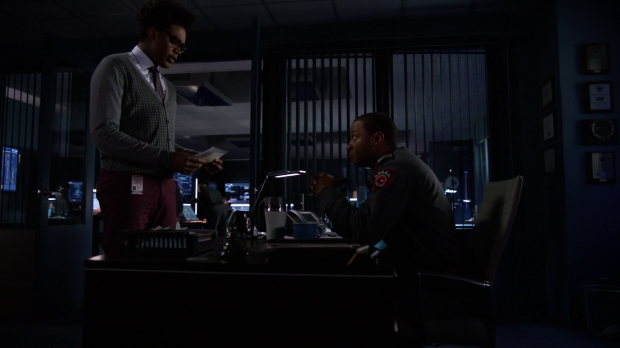 Diggle’s respect for Curtis’ decision and the parting with no hard feelings is classic Diggle and serves as a reminder of the strength of the connection that has been forged between them. 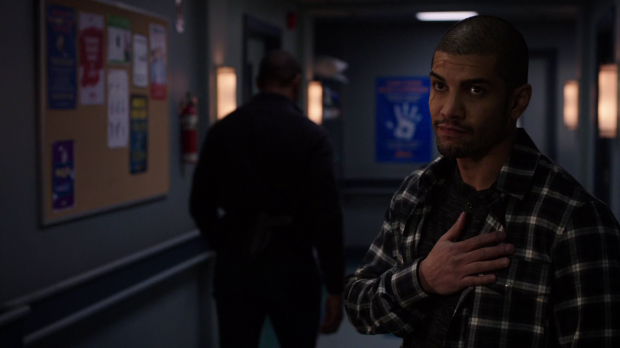 Rene putting his hand over his heart to say goodbye without any words was note perfect as well. Their friendship has always been great and the simple gesture worked better than on the nose dialogue ever would have. A strong character driven episode that leads into the family drama and provides some interesting future timeline answers. Oliver’s eventual decision to let William live with his grandparents makes a lot of sense especially with him coming to the realisation that it’s far too dangerous for William to live with him and Felicity due to the constant threats against his life. The writers exploring this realisation is an acknowledgement of the focus that the show has to have and that it’s impossible for Oliver to be an effective parent while he remains committed to protecting the city as the Green Arrow. Letting this be part of the story is a good use of a conceit that keeps the show on the air and provides plenty of opportunity for engaging character drama. Oliver has always been a flawed individual but continues to improve himself as time goes on. The current flaw being explored is his propensity to make situations all about him which has a knock on effect on William who feels sidelined hence him taking his future into his own hands. The parting scene is really well acted helping to underpin the situation as a moving emotional moment. William going to live with his grandparents syncs up with his future self by explaining why he hasn’t seen Oliver and Felicity for years. Felicity taking a phone call where she presumably learns that she’s pregnant combined with the future reveal that Blackstar’s real name is Mia Smoak which makes her Oliver and Felicity’s daughter is really effective and almost makes up for the tedious hostage situation that made the future scenes feel unnecessarily drawn out. There’s a potentially fun dynamic here with William, Mia and Connor aka John Jr. acting as Original Team Arrow: The Next Generation. Each of the children are in different roles to the parent could be a lot of fun if the writers choose to make use of this. The serial killer plot in the present day is very hit and miss with a Scooby Doo style horror situation that is more laughable than anything else until the admittedly effective shock of Dinah having her throat slit and potentially losing her Canary Cry. Stanley is far less nuanced than he was when interacting with Oliver in prison which dulls the impact of his return as he’s relegated to another insane villain of the week who is easily dealt with. There was so much potential for Stanley to be a very different threat to Oliver that this episode fails to capitalise on. The potential exit of Curtis was handled really well. It was very in character to have him leave to pursue his own version of doing good in the world as a result of his dissatisfaction with how A.R.G.U.S. operates. His “no hard feelings” farewell with Diggle is great and the simple gesture by way of a goodbye from Rene is nothing short of perfect.